I have demonstrated a great deal of scholarship throughout my school years. 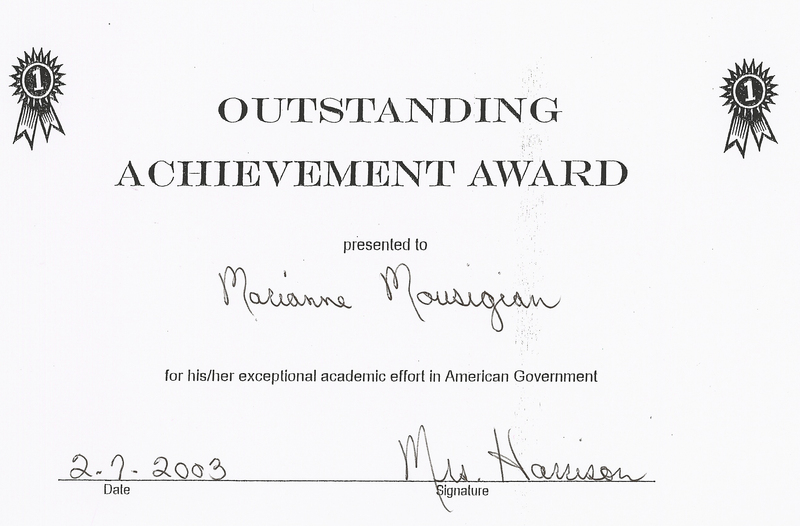 I've always taken great pride in my academics and have always strived for excellence. I've never settled on anything that did not reflect my absolute highest capability. My work and grades have always been among my very highest priorities, and I have never let my grade point average fall below a 4.0. Though I have received a substantial number of awards throughout my lifetime, this one means the most to me. In order to earn it, I always did my best to strive for excellence, rather than just settle for a grade of an "A." Instead of simply fulfilling the requirements of a project or assignment, I always tried to go above and beyond the expectations. My goal was not to get a high grade, but have a sense of pride in each piece of work I completed. This award shows that I am a very dedicated student with an exceptional work ethic. Receiving this award motivated me to take my work ethic to an even higher level. This award was given to my group for our outstanding math PowerPoint presentation. Our project clearly went beyond the expectations. In order to produce such an excellent project, my group worked very well together. We divided the work up very efficiently all all contributed our ideas. While working on it, I learned a lot about team skills and cooperation. It was a very valuable experience. This is an example of my work. I was very thorough and clearly strived for excellence on this math lab. I made sure my work was neat, descriptive, and included plenty of graphs and visuals. To do this, I incorporated a lot of technology into my work. My TI-83 plus silver edition calculator and graphlink software were used to include graphs. I used Paint to neatly sketch the experiment that was conducted. Finally, the whole lab was typed in Microsoft word. Since I utilized my resources well and put a lot of effort into my work, I was very proud of my finished product. This award shows that I put forth a lot of effort in all of my classes. Governement has always been one of the most difficult subjects for me, but with a lot of hard work, time, and effort, I was still able to excel in my Advanced Placement U.S. Government and Politics class and receive this award. I was very honored to have my poem published in The America Library of Poetry's book,Visions of Youth. 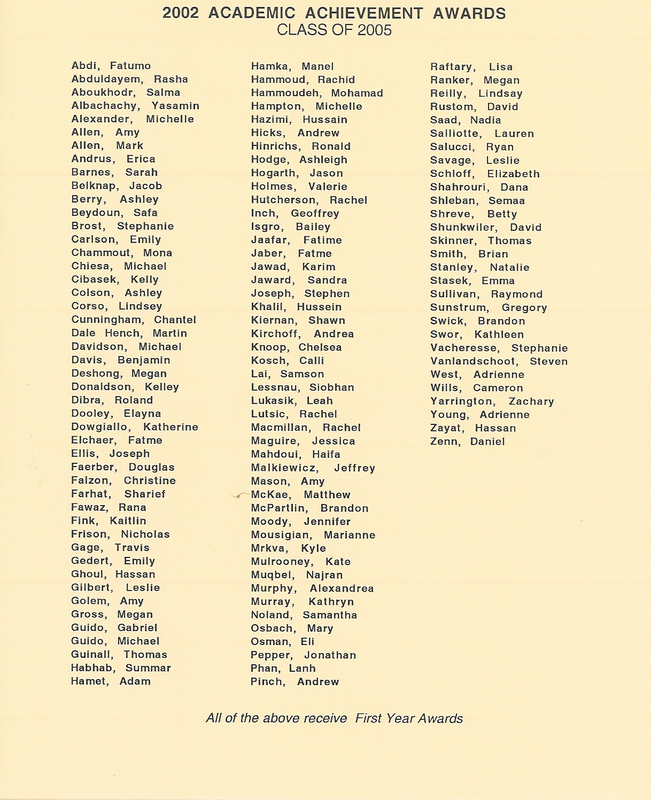 It shows that I achieved literary excellence in the area of poetry. This honor motivated me to continue striving for excellence in this area. 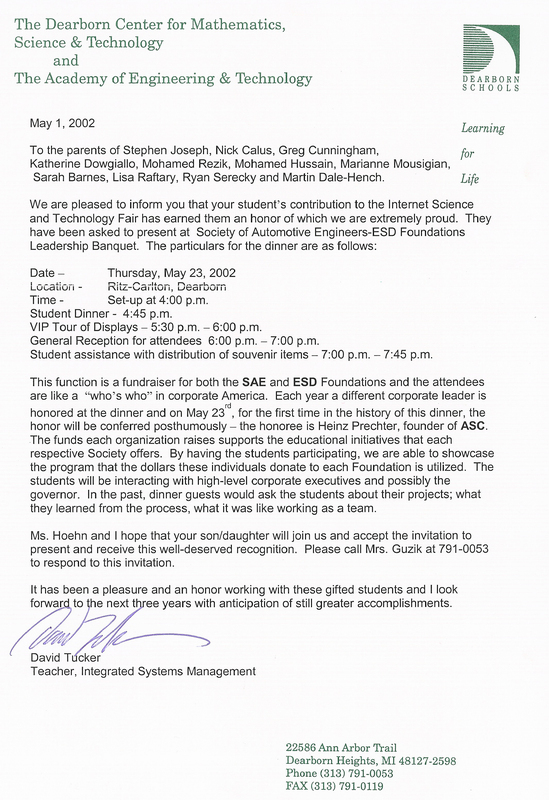 During my freshman year, my group was honored for our outstanding Internet Science and Technology Fair (ISTF) project about vaccines. We presented our project to the Society of Automotive Engineers-ESD foundation and to Michigan's governor, Governor Engler. This project took a lot of teamwork and coorperation. It was also a very valuable experience to be able to present our project to others. I improved my presenation skills as a result. I recieved my varsity letter for academic achievement in the fall of my sophomore year. This allowed me to wear my varsity jacket not only for my athletic abililities, but academic ones as well.